put into action in our weekly investment meetings. At Recurrent, we invest by using commodity price as an output of – rather than an input to – our process. We believe that basing decisions on commodity forecasts, which often assume rising prices, can lead to inferior investment decisions. We believe that company valuations can be used to derive market expectations of company-level returns (see more in “How We Invest”). Those company-level returns are based on implied future commodity prices. In effect, every company that produces, consumes, or services the energy industry has a valuation that implies a commodity price forecast. At any given time, the various sectors that touch energy – exploration and production, services, midstream, refining, chemicals, industrials, power producers and others – all imply commodity prices that are often significantly different from one another. By understanding which sectors and which companies imply the most attractively-priced oil barrels and cubic feet of gas, we create a framework for success regardless of where the underlying commodity is headed. Energy Strategy: We screen several hundred companies across the industry, from energy producers to energy consumers, and whittle them down to roughly 100 using a variety of financial metrics, including Price to Book (P/B), Price to Earnings (P/E), and Enterprise value to earnings before interest, taxes, and D&A (EV/EBITDA). Midstream Income Strategy: We screen around 120 energy infrastructure companies down to roughly 50-60 using a variety of financial metrics such as Free Cash Flow yield and EV/EBITDA. One valuation methodology we use extensively compares a company’s return-on-invested-capital (ROIC) to the cost of capital (WACC). 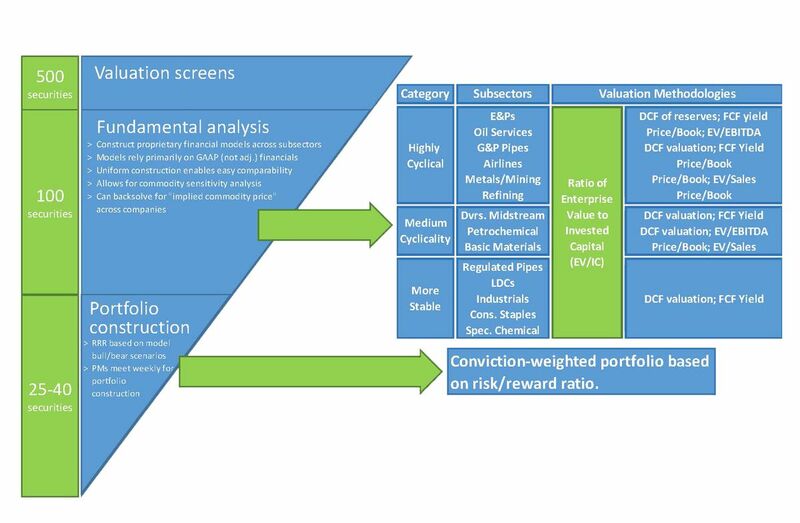 This valuation methodology informs us of how effectively companies compound the value of their invested capital. More specifically, the relationship between a company’s ROIC and WACC should correspond to the relationship between a company’s Enterprise Value and Invested Capital (EV/IC). We focus especially on EV/IC because we believe that it has unique, non-cyclical properties. Neither EV nor IC is influenced by commodity-driven earnings fluctuations, while earnings and cash flows used in multiple analyses are typically market-to-market based on commodity price changes. We pass all investment decisions through a rigorous, value-oriented, bottom-up analysis. As we complete our valuation analysis, we determine the upside, downside and base cases and rank the stocks by the upside vs downside opportunity. Those stocks ranking in the top quartile become buy candidates whereas those in the bottom two quartiles become sell candidates. We formally review the portfolio of 25-40 companies in the Energy Strategy and 20-35 in the Midstream Income Strategy at weekly investment meetings.